Click the above image for a full-size widescreen wallpaper sized 1920×1200. This is scanned from a 1979 Marvel comics house ad for the series. The Marvel comic version of the Mattel toy line was short lived (20 issues) but was quite good with art by the legendary Herb Trimpe (also did the art here for the ad) and written by the great Doug Moench. It’s also one of the very first comics I remember collecting & reading as well as actually buying myself with my own money right off the rack. God I MISS those squeaky spinner-racks. (One of these days I’m gonna buy one off eBay or something if I can ever find a good deal on one.) 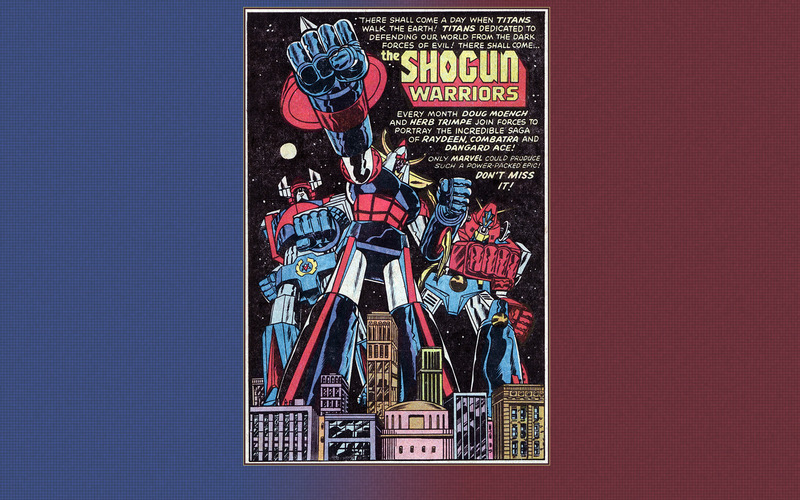 I also love to point out that the Shogun Warriors were the “original” Giant Robots predating Gobots AND Transformers by at least 4.5 years. Have you seen this story yet? No I hadn’t. That’s pretty wild. Yeah, girls can be giant robot nerds too.